This 4 story Wichita hotel consists of 88 beautifully decorated suites. 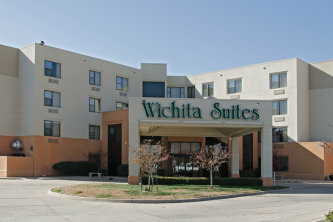 Wichita Suites is located 5 miles from the Boeing Plant on the East side of Wichita. This 4 story hotel consists of 88 beautifully decorated suites. Wichita Suites offers complimentary Sunday Breakfast 7:00 am to 10:00 am and a Buffet Breakfast Monday thru Saturday 6:30 am to 9:30 am. Cocktails are served Monday thru Saturday 5:00 pm to 7:00 pm.